A loving family has adopted two foster children. Everything is great right? Yes, certainly better than the alternative, says Joanna Seigneur, who with husband Tim has hosted multiple foster children and adopted two. Their family actually includes three adopted children, though the older child did not come through the foster system. The adventure only begins with formal adoption, Seigneur says. Foster children carry lots of baggage — and expense — conventionally raised kids might not. It’s easy to understand how college savings accounts fall through the cracks. That’s the motivation for the May 20th SMART5.29K run/walk. 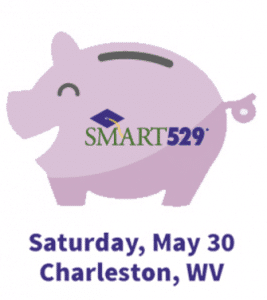 For the third straight year, sponsorships and race fees will provide adoptive families starting funds for their kids’ SMART529 college savings accounts. Sponsored by State Treasurer John Perdue’s office, the race is measured at exactly 5.29 kilometers – to draw attention to the IRS tax code which makes such plans possible. It is also in reference to May 29, designated each year as National College Savings Day. To register, go to https://runsignup.com/Race/WV/Charleston/SMART529K and click SIGN UP. Pre-registration is $30 and ends midnight May 17. Race day registration is $35. The 8 a.m. run begins and ends at Appalachian Power Park’s third base entrance. The walk begins 10 minutes later. Participants wind a short distance to Piedmont Road and stay on that artery to the state Capitol. The way back is identical. T-shirts will be available on a first come/first served basis, while supplies last. The event will take place rain or shine. All registration fees are non-refundable and non-transferable. Mission West Virginia and its adoption placement arm, Frameworks, will select families to receive funds through an application process. Treasurer Perdue and Frameworks will honor them at a Clay Center ceremony this fall. The Seigneurs received $1,200 last year. Twelve children in total received $1,200 each. Seigneur acknowledged that foster families receive adoption agency funds to take care of children. Ordinary expenses eat up much of it, she said. That’s why the scholarship award and accompanying dinner mean so much, she said. Statistics from Research Highlights on Education and Foster Care illustrate the difficulty foster children have in reaching college. Thirty-four percent of 17- and 18-year-old in foster care have experienced more than five school changes. Their likelihood of being absent from school is twice that of other students. The average reading level of 17- and 18-year-olds in foster care is 7th grade. Only half of foster students complete high school by 18. Just two to nine percent of former foster youth attain a bachelor’s degree. Jim Strawn & Company is proud to support the 3rd Annual 5.29K event.